Hi Steve and Mary, Well Calis (from Karrobar Moss & Libby) is almost 15 months old now, and still continues to delight us daily with his 'smarts'. Dad, who has had many dogs throughout his lifetime, is particularly impressed and is thinking about getting a female. He claims it is as a playmate for Calis, but I am convinced that it is because he will miss Calis too much when I leave home - even if I am only ½ hour away! As for Calis himself, he is quickly becoming a surf dog - it will only be a matter of time until he gets on the board with me! - and he particularly loves camping and long long walks. Soccer, tennis and chasing bubbles are also rating highly, and he is still the most sociable dog I have ever met. I have depleted his energy only a few times (that's when he hides his toys so we have to stop playing), and he is keeping my parents fit. I am looking forward to the possibility of getting him a friend, so fingers crossed! Suzanne also came back in 2003 and bought another puppy with her father. This is Noonbarra Bindi II. 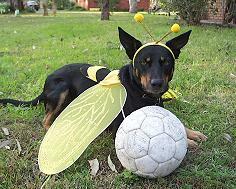 Attached is a picture of my soccer team mascot from Sunday - he is very patient with my requests! I only had it on him for 5 minutes for photos, and he very quietly endured it like the little champ that he is. Although I got heaps of kisses when I took it off! 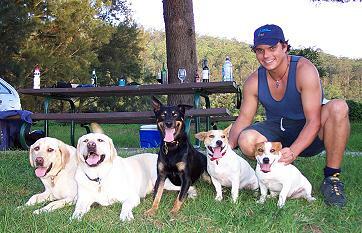 "Photo is from a regular dog day that my workmates and I have. We get all our dogs together and have a BBQ, a swim in the river and a game of footy/cricket. The dogs all get along fantastically, the Jack Russell pup in particular fawns all over Calis." Dear Steve and Mary, You will be so proud!! Here is an article on page 2 of today's Sydney Morning Herald. The photo is of my friend's Craig and Linda's dog Buddy - who is Calis' special 'buddy' if you know what I mean - winning his heat. Calis won his heat by an absolute mile, and went on to blitz the big race. He was the picture of focus and shot down the field like a bullet, dead straight and low. Not to mention he won me $300 in the final (not $200 like the article said), and won his lucky punter in the crowd $300 through a Calcutta auction. He is a star!!!! It will take us 6 months to get through all the dog food.....and to get over his strutting, 'I am the King'!!! The article doesn't mention it, but the main race is open only to working breeds, the rest are mongrel and housedog events. Poor old Bindi....while Calis was off being the champion, Bindi got wiped out in her race in a spectacular crash, so in her subsequent races when the flag dropped she just ran a few metres, stopped and went on SpookAlert. about the month long roadtrip in the Kombi Calis and I did last November, outback through Wilcannia and Broken Hill to Adelaide, then down to the coast and surfing along the Victorian coastline. But I'll do one on the Dog Race if you think that would be good. The Herald photographer is going to burn all his photos on a disk for me, so I will ask him if I can use a couple in the article. I hope all is well, and that you are 100%well again Mary! 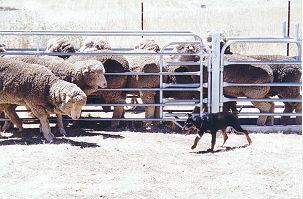 Bindi is a very dark red & tan like her sire, Noonbarra Flash. Bindi went to Graham in Sydney. His daughter, Susanne bought Noonbarra Calis some time ago and they are having great fun together so her father thought he would get himself a little mate as well. "I have no concern whatsoever that Calis and the new pup won't get on, as Calis has yet to meet a dog that he didn't think was his best buddy. He has developed quite a little social network of doggie mates. 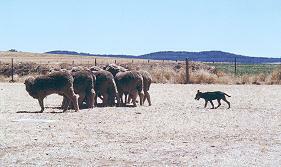 Apart from spending a day a week at a workmate's place with his Jack Russel, he also regularly visits a friend with a border collie, and another with a kelpie and a cattle dog cross. This of course apart from the neighborhood dogs that wander over. We are travelling to Nundle in May with these last two to participate in the 'Great Nundle Dog Race'! I will let you know how we get on." Hi Mary and Steve, Just a very quick mail to say that all is well with Bindi. Calis was very stand-offish on the first day, I could see he was trying to figure out the hierarchy and his role. But having a little pup fawning after him has done the trick, and now they play together all day - he even wakes her up when she is exhausted. 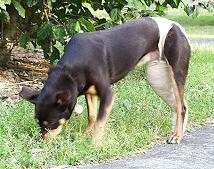 While still a pup, Noonbarra Bindi II managed to break her leg. 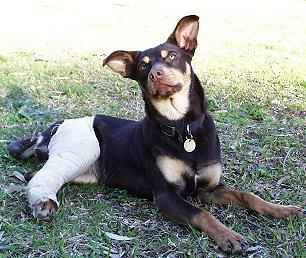 "Here is a picture of Bindi in her cast, she has another 4 weeks to go. I doesn't seem to bother her in the least, until she tries to scratch behind her ear with that leg, then its a very funny puzzled expression. You can see that while she is not what I'd call fat, she is quite solid. Particularly her neck/chest. She fractured her fibula, and also got a spiral fracture of her tibia." 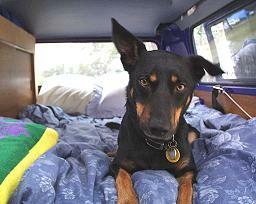 "We started clicker training with Bindi 3 weeks ago, which has led to some really nice results. 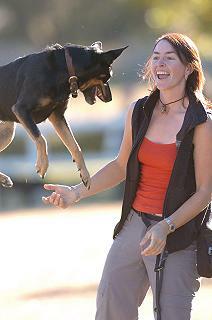 A bit more work with her training seems to be needed than with Calis, perhaps because he is such a distraction. ... . Another new nickname has been given, 'Marylin' because of her hip swinging walk - or waddle as I like to say - she is a fat little thing (compared with Calis at the same age). Bindi is the first dog I have ever met that eats her worming tablets without food wrapped around it!"